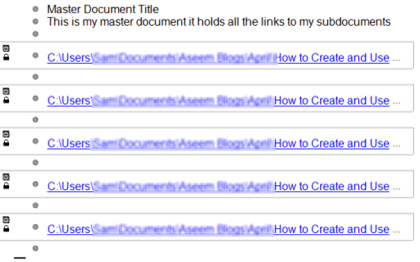 Master documents in Word are documents that merge together and hold links to several smaller documents. Their purpose is to support the management of large documents by allowing the user to “fold” up the subdocuments into links, thereby leaving the master document with an organized framework. Subdocuments must be at least one level higher than the basic Body Text of the original document. 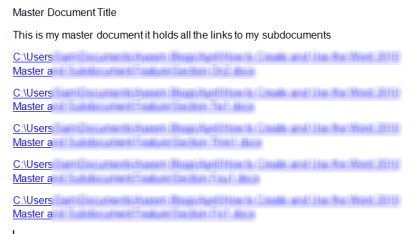 Here, Word is showing you that it has created a link to each of the subdocument files it created and saved to your hard drive. This is what your master document looks like now (when it’s not in outline mode anymore) with all of the subdocument links, instead of the actual text for them. 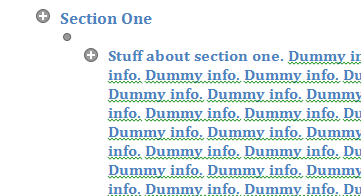 Using them this way allows you to see your whole document in separate sections, or pieces, rather than as one big unit. …which is how it was written in the first place. 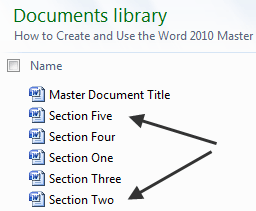 The Master/Sub document feature of Word is useful for long research papers, dissertations, short story collections or any other document that can be divided up easily into sections.